In the vast majority of cases when considering how to finance a business, the owners and management team can only provide a small fraction of the funds required and outside help is usually required. A business plan financial projection will answer the question of how much funding a business will need to launch and operate successfully. It will identify the peak funding and the period for which your business needs this funding for. The next question is how and from where your business can be best financed. There are many different types and sources of finance but generally they fall into one of two categories, Equity or Debt. Equity includes capital injected by the owners or outside investors in the business, such as angel investors, venture capital investors, or the stock markets. Any retained profits of the business are also classified as equity. Equity investors do not normally require security, and share the risks and rewards of ownership of the business. The cost of equity finance arises because you sell part of the ownership of your business in return for the funds and a percentage of the profits will now belong to another party. The business pays a share of profits out as a dividend to the shareholders. As dividends are not treated as an expense, they do not normally reduce the tax liabilities of the business. What are the losses likely to be? What the Return on Investment and Return on Equity are? That there is a clear exit strategy. Will the business pay dividends? Investors take the highest risk of all the providers of finance as they can only take a share of the profits after interest and other liabilities have been paid. Accordingly, they normally seek a higher return on their investment than debt finance providers. Debt includes loans from family and friends, bank loans and overdrafts, government loans, mortgages, and leasing. Providers of loan finance for financing a new business usually require security for the debt, such as a mortgage on a property or personal guarantees. In addition they will impose performance related criteria, called covenants to continue to provide the loan. The cost of debt finance is the interest and fees payable to the lender based on the amount of money borrowed and the duration of the loan. The interest payments are normally an expense of the business and therefore reduce its tax liabilities. How much money does the business need and how will it be used? When is it needed and how long for? That security is available if it all goes wrong? How much the owners have invested? Is management information useful and up to date? 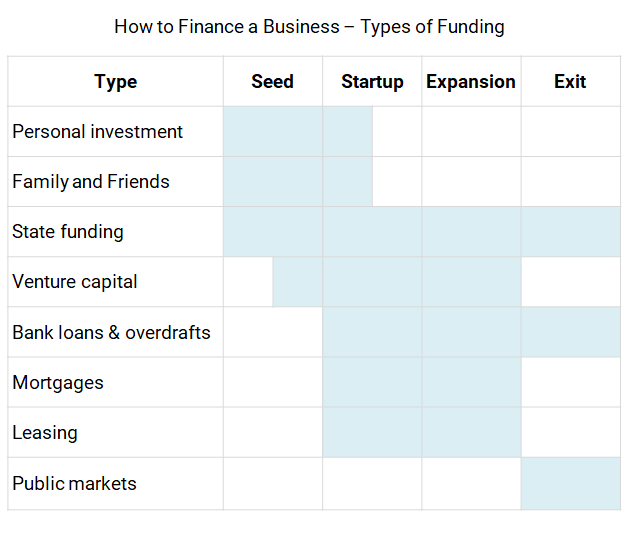 Different types of finance are suitable at different stages in the development of the business. The following chart summarizes the use of the major sources of finance.